Raw Love Recipes: Sprouting - Have you tried it? 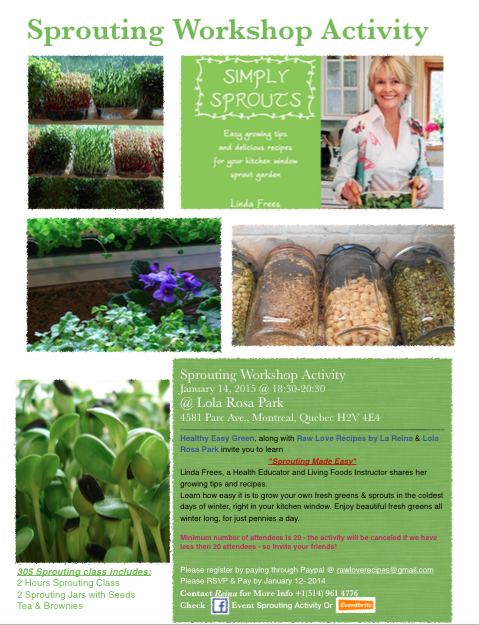 Sprouting - Have you tried it? My first sprouting activity happened, when Linda Frees, a Health Educator and Living Foods Instructor from Healthy Easy Green, passed by to my place to bring me the biomat to try out. Knowing about what she does, her classes and all, I asked her about Sprouting, and she was so generous to show me how easy it is to sprout. I had the materials right there in my kitchen, without even knowing it. I won't put all the details here as her and I are organizing an hands on workshop activity to learn how to sprout! Isn't that Fun! The event is happening on January 14, 2015 at Flash Expresso, on 2471 Notre-Dame Ouest, Montreal, H3J 1N6 at 6:30 pm - 8:30 pm. Learn how easy it is to grow your own fresh greens and sprouts in the coldest days of winter, right in your kitchen window. Enjoy beautiful fresh greens all winter long, for just pennies a day. Bring your lovely smiles along! Minimum number of attendees is 20 - the activity will be canceled if we have less then 20 attendees - so Invite your friends! I am ready to Sprout!